How Far is Sai Nikita Niki's Brundavanam VI? Sai Nikita Niki's Brundavanam VI, a residential plot project located in Bhongir, Hyderabad. The project is located in one of the best locations in Hyderabad to build a home, conveniently located near to proposed Regional Ring Road. Come and explore this place and experience the elegant and tranquil environment around you. Plots which refines the living in Hyderabad city. 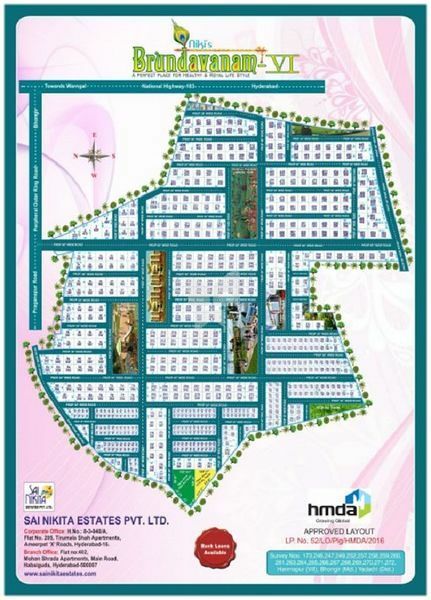 Sai Nikita Niki's Brundavanam VI offers plots for sale in Bhongir, size of the plots varies from 540 Sq yd to 2700 Sq yd. The newest project developed by Sai Nikita Estates Private Limited. A place where elegance meets the fitness and fine living. Luxurious plot perfectly placed near to all your lifestyle needs. In this stunning project, you can find best in every corner bounded by lush greenery and well equipped with ultra-luxurious amenities to make sure the residents lead a hassle-free life. Be a part of this amazing project to experience the best of Hyderabad city. Along with Plots in Bhongir the project offers amazing carefully crafted amenities so that the residents can lead a hassle-free life, some of the amenities are blacktop road, street lighting, avenue trees, gym, jogging track, indoor games, restaurant and swimming pool.